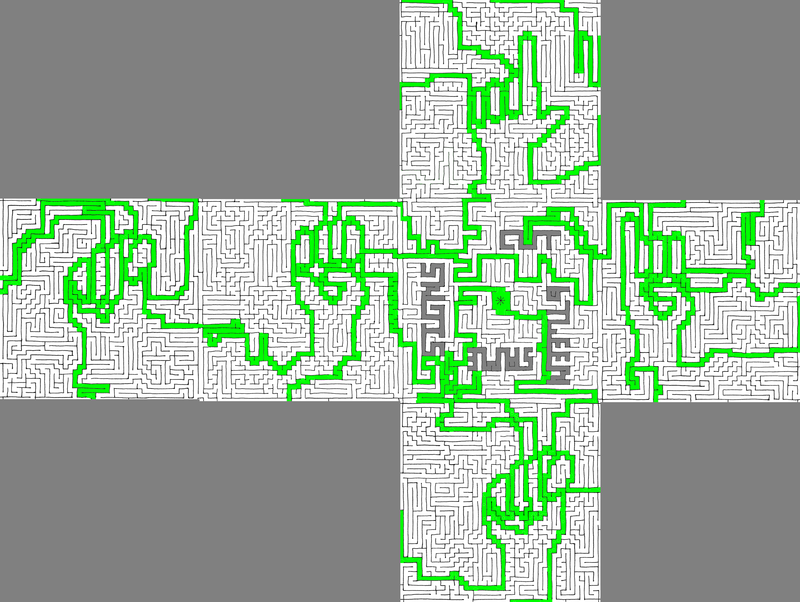 This puzzle contains six mazes, with signs sticking out at the corners. The first thing to notice is that one of the mazes (#6) has a star in the middle. 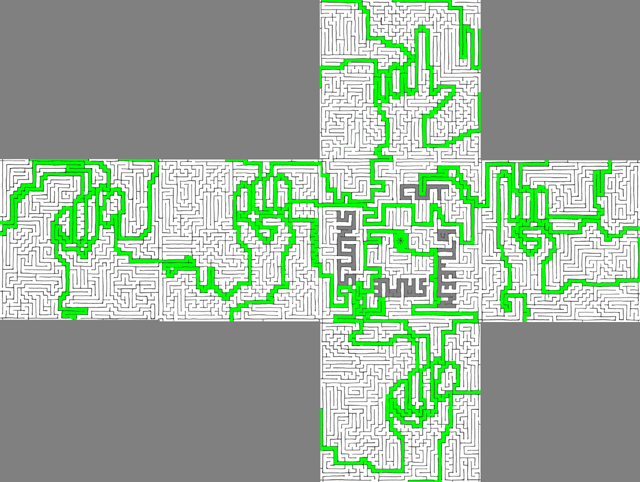 This maze also has five disconnected regions; when colored, one can read the phrase "CUT BTWEEN SAME SIGNS", (cut between same signs). The phrase indicates that one should, for each maze, cut between matching signs, i.e. along the signposts. This is effectively the same as cutting along the perimeter of each maze, except half a passage-width in from the actual perimeter. Once the mazes are cut out, they can be assembled into a cube by matching edge markings, to form a single maze on the surface of the cube. The new maze begins and ends at the star. Tracing out the shortest path (i.e. always taking the shorter of two alternative routes to a destination, ignoring spurs, etc) through the maze produces, for each side except the starred side, an approximation of an image of a hand. Each hand is signing a letter from the American Sign Language alphabet (clued by "maybe if I follow these signs"). The letters are T, E, L, I, and T. Anagramming these letters spells the word "title." "Title" is not the answer but rather the clue phrase. The answer is QUAGMIRE (ha ha).